Swimming Pool Covers offer a variety of benefits – depending on what you would you like to achieve with your swimming pool cover will decide what type you should invest in. Century Pools offers a wide variety of Swimming Pool Covers. We have above ground pool covers and in-ground pool covers, and both mesh and solid Safety Pool Covers. We offer covers manufactured by:Pacific, GLI Pool Products and Merlin. 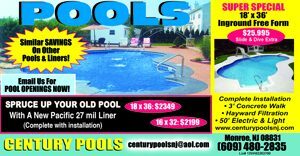 For help with choosing the right Pool Cover, please contact Century Pools at 609.480.2835 or fill out our Contact Form on the left side of the page. Look out for future announcements for our upcoming mobile showroom!